The team currently known as Sahara Force India have revealed their 2018 car this morning in Barcelona ahead of the first day of pre-season testing. 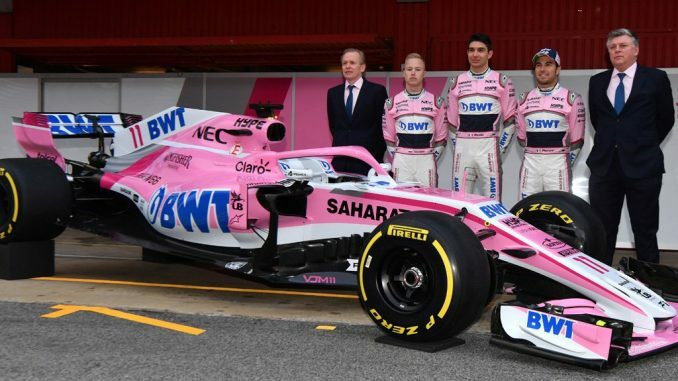 The car, which once again is named after team principal Vijay Mallya, again features the mainly pink colour-scheme of sponsor BWT and will be driven for the second year in succession by Sergio Perez and Mercedes loanee Esteban Ocon. Speculation is mounting that the team will announce their new name and ownership on Tuesday (February 27th) with a number of potential buyers mentioned, including British energy drink manufacturer Rich Energy. However the team will take to the track on the first of eight days of testing at the Circuit de Catalunya in Barcelona with the name that they have raced under since their debut in 2008 after purchasing the team from the Dutch sports car manufacturer Spyker.